Drowning Impact Awareness Month – Join Now! 2014 is the eleventh year that the Phoenix Children’s Hospital (PCH) has designated August as Drowning Impact Awareness Month (DIAM). Arizona is second nationally for child drowning, and every loss has an impact on family, friends, emergency personnel, and the community. 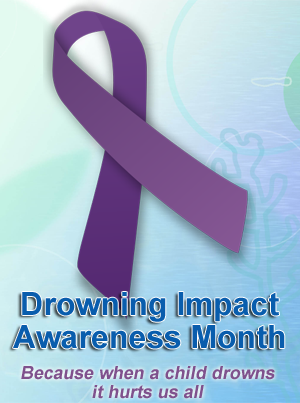 Help distribute purple ribbons to remember the impact of child drownings and to commit to be water safe. You’ll see purple ribbons at Phoenix Children’s Hospital, local Fire Departments, businesses, schools, churches and on media personalities. More than 100,000 ribbons are expected to be displayed. Distribute purple ribbons at your office. Include water safety information in existing newsletters and marketing efforts. Incorporate Drowning Impact Awareness into activities throughout August.